What does Macron want to change in his labour reforms? Emmanuel Macron today faces his biggest challenge as French president: a shake-up of France’s strict, and fervently defended, labour laws. Why is a change in the laws due? The goal is to slash unemployment – which has been above 9 percent for nearly a decade – and make the economy more competitive. Who is opposing the change? The far left and some unions don’t like Macron’s method as they think the changes could weaken the protection that workers currently get. By choosing to fast-track the reform using executive orders, the government is avoiding a lengthy debate in parliament on some controversial measures. Many took to the streets of Paris and other French cities today (September 12) to protest the reforms. “Macron is someone who’s never worked in his life. He studied but he’s never worked in his life. How’s he supposed to understand the people? It’s impossible,” said one Paris protester. Also in attendance at the rally was the head of France’s major CGT trade union, Philippe Martinez: “None of the reforms in this country which ripped up the labour law – nor in any other country, by the way – has changed the unemployment curve. It creates precariousness and undeclared work,” he said. What exactly does Macron want to change? The changes include giving employers more freedom to negotiate working conditions directly with their employees, rather than being subject to industry-wide agreements. Compensation for unfair dismissal would also be capped, and it would be easier for multinationals to lay staff off in struggling French companies. Why haven’t the laws been changed before now? Governments left and right have been trying for decades to overhaul France’s 3,000-page labour code but ended up watering down their plans in the face of street protests. Last year, thousands of protesters took to the streets to object to then-president Francois Hollande signing into law other significant reforms of the country’s labour rules. The protests, which in some cases turned violent, saw at least 39 people arrested, some before they had even started marching. How are these changes affecting Macron’s popularity? Macron’s plans to reform the labour market to make it more flexible and business-friendly were at the heart of his presidential campaign. But his popularity has tumbled since he was elected and he again stirred controversy last week on a trip to Greece when he labelled those who oppose change “lazy” and “cynical”. “I am fully determined and I won’t cede any ground, not to slackers, nor cynics, nor hardliners,” he told business leaders in Athens. He said the “slackers” comment targeted those who had failed to push through reforms in the past, but many viewed it as an attack on those collecting unemployment benefits or on workers making the most of job protection. 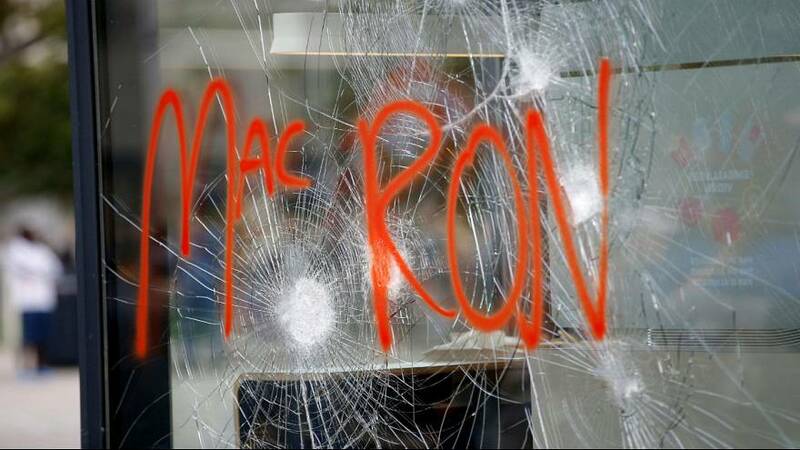 All of this is not going down well in a country that deeply prizes its social model and after Hollande’s 2016 reforms, in many ways, Macron’s changes are only a continuation of his predecessor’s.